KISS will play their only New Zealand show in Auckland at Spark Arena on 3 December 2019. Tickets will go on general sale at 10am (local time), Monday 12 November 2018. KISS first visited New Zealand in 1980 and are looking forward to returning to our shores one last time. 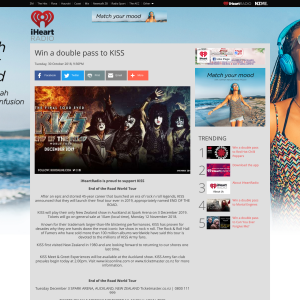 KISS Meet & Greet Experiences will be available at the Auckland show. KISS Army fan club presales begin today at 2.00pm. Visit www.kissonline.com or www.ticketmaster.co.nz for more information. 4. This competition closes on the 24 February 11.59pm. Winner to be notified via phone.